Property 3: Cottage with sunny wooden deck by water. 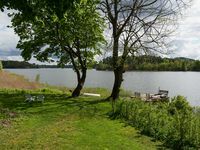 Property 13: Newly renovated house Stockholm & archipelago - 200 meters to lake. Beautiful villa with pool close to town. Very near buses to town and island. Property 47: Beautiful villa with pool close to town. Very near buses to town and island. Exclusive house with pool and sea view over the archipelago of Stockholm close to nature and city. Property 49: Exclusive house with pool and sea view over the archipelago of Stockholm close to nature and city. I would highly recommend a stay at this beautiful lakeside home in Stockholm. It a gorgeous home with all of the amenities one could hope for. The owners were responsive and kind and the location was absolutely perfect for access to the city and to nature walks. What a perfect getaway. Our family could not have been happier. Beautiful house with Swedish charm. Well located to visit Stockholm and the north of the city. During these two weeks of family travel we enjoyed the elegant comfort of this house with its terraces and garden (thanks Siri for the plums!). Well placed for our program (Stockholm by subway and the area north of the city by car), Danderyd offers all comodities, calm and walks by the sea. Siri, always attentive to our needs, helped us a lot to organize our stay and give us good addresses.